Comprehensive 'legal cover' for leaving EU, which keeps the Eurostar running, UK drivers' licences in EU, flights by planes etc, etc. Allows for a transition period - March 30, 2018 to December 31, 2019. The UK, in effect, remains under all the EU rules for a bit longer. We have more time to prepare for the exit. In transition and, indeed, in any operation of the back-stop, Northern Ireland plus Great Britain remain in the EU's customs arrangements. Northern Ireland remains in the single market. UK continues to pay its dues to EU until transition period is over - at least £39bn. Could the UK ever exit from the customs union type arrangements? And if it could leave, the EU might oblige it to "leave behind" Northern Ireland which would then face tariff barriers relative to GB. Checks on GB-to-Northern Ireland sales, which amount to about £11bn annually, to ensure compliance with EU single market regulations. Could that mean higher costs for grocery imports? Note that our "imports" from GB are several times higher than those coming from the Republic plus rest of the EU. 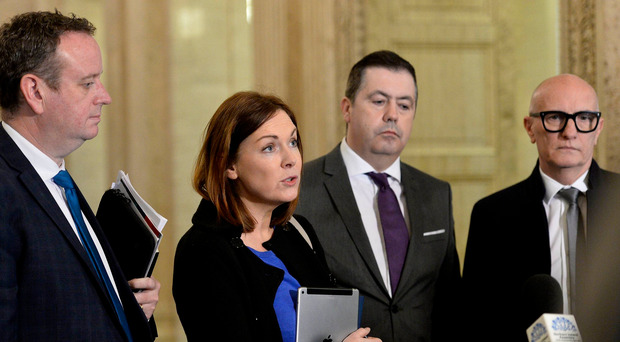 Northern Ireland could become a passive rule-taker. Would that promote improvements in competitiveness and productivity? How to avoid the Irish hard border if the UK wants to leave the customs union? How much access will EU fishing boats get to UK waters? How far would the UK be allowed to seek competitiveness through deviating from EU regulations (allied to the question of how far in practice the UK would still be subject to the European Court of Justice)? The impression is sometimes given that this would be the same as being cut off from continental Europe/the Republic through blockade or quarantine. In reality, it is a lot more drastic than that. Most countries around the world are not members of the EU and most of those non-European countries do trade with the EU, some very successfully. In the case of Brexit the more realistic fear relates to the incremental effect on trade through increased frictions. The UK would be liable to pay the EU's tariff on any exports into the EU - for most manufactured goods that tax is quite small though tariffs on food products are higher. It remains to be seen how far a series of small scale holding agreements could be put in place to maintain easy economic flows across the frontiers. The logic here is that the DWA has left some Brexiteers and Remainers feeling very unsatisfied. So, why not go back to Brussels and ask (demand?) more? But, would any such approach receive a favourable response? The stated position of the commissions and European leaders is "thus far and no further". It could be that UK negotiators would get more if, for the first time, they indicated they were willing to accept a "no deal" in preference to what the EU has offered. A third way becomes more viable if both the UK and the EU27 are willing to prolong the withdrawal process in the sense of pushing back the March 29 2019 deadline. Technological solutions to the Irish border issue become more feasible over a longer period of time.